With all the cop drama TV shows and films that have come out over the years and the corruption thrillers, revisiting an old noir thriller such as “Touch of Evil” about cops taking justice into their own hands can be unexciting. There’s very little that those of a younger generation haven’t seen before, so what separates “Touch of Evil” from the pack? Good film-making. In the long tracking shot that consumes the opening scene, you understand right away that Orson Welles is serious about his finest directorial effort, and that no matter how un-thrilling the story might be, that this what good movies look like. I watched the 1998 re-release featuring scenes that the studio cut that Welles wanted to keep in, always the best way to watch a classic in a time where this was even more common practice than it is today. Welles’ style is reminiscent of Hitchcock, only choosing close-ups in critical scenes so that they have a big dramatic impact. I can only speculate, but I wouldn’t be surprised if “Touch of Evil” got actress Janet Leigh her unforgettable role in “Psycho” two years later. “Touch of Evil” stars Charlton Heston fresh off the heels of “The Ten Commandments” as Mike Vargas, a (unconvincing) Mexican narcotics official that’s wanted dead by a Mexican narcotics dealer gets caught playing a role in a murder investigation when a car explodes when he and his wife Susie (Leigh) are on Honeymoon in a Mexican border town. 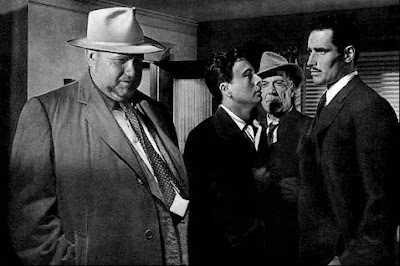 The infamous local police captain Hank Quinlan (an almost unrecognizably overweight Welles) suspects a Mexican national and soon Vargas is on to Quinlan, accusing him of planting evidence. Meanwhile, Susie is kidnapped by the dealer’s nephews to be used as a bargaining chip. Not just directing and writing, but from an acting standpoint, this is Welles’ film too. Not only does Quinlan take up much of the screen, but his old crooked persona makes him easily the most interesting character. He’s a cop struggling between right and wrong, operating on a false sense of justice. It’s not highly original, but Quinlan is our main draw to the story. It’s certainly not Heston pretending to be Mexican. Quick pacing and suspenseful, shadowy direction is the real signature Welles leaves on the film. There’s no particular emotional investment in the story or characters, just intrigue in knowing when everything is going to finally get nasty and dangerous instead of the continuous verbal accusations. Welles does deliver and brings the film to a thrilling climax that confirms our suspicions of what was really the most important part of his film.